Since the first of six SSEP flight opportunities to date, on the final flight of Space Shuttle Endeavour (STS-134) back in May 2011, 18,500 grade 5-14 students have been fully engaged in experiment design and proposal writing, 4,347 proposals have been received from student teams, 53 flight experiments have flown on Space Shuttles or to ISS, with 17 more now in NASA flight safety review for Mission 3, and 51 communities in the U.S. and Canada have truly been part of the Space Program. It is a stunning achievement, and none of it would be possible without the passion for teaching and unwaivering dedication to our children of all the SSEP teachers and administrators. The National Center for Earth and Space Science Education can provide the programmatic framework, but SSEP’s ability to inspire and engage the next generation of scientists and engineers is firmly in the hands of all the teachers and administrators on the ground. 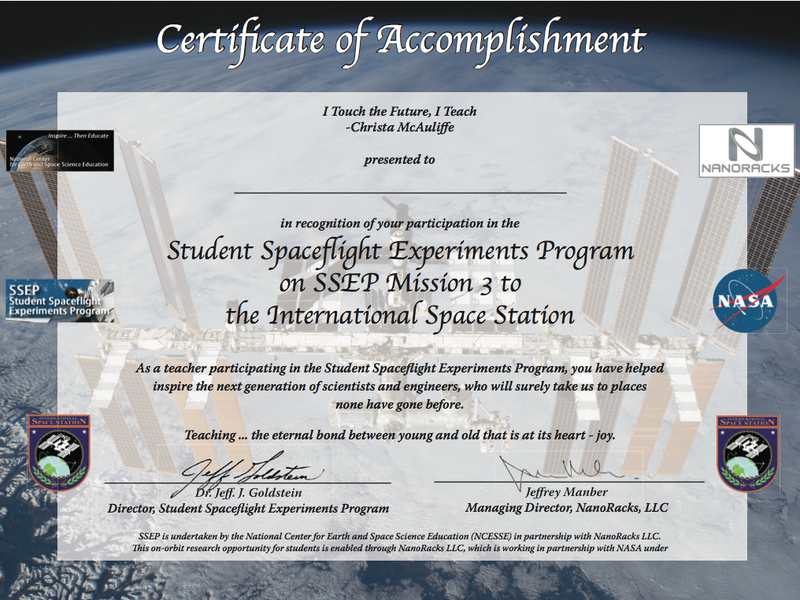 It is therefore with great pride that the Center, and its international arm, the Arthur C. Clarke Institute for Space Education, make available a new Certificate of Accomplishment for SSEP teachers and administrators. We invite SSEP Community Program Directors to contact Stacy Hamel, the Center’s SSEP Flight Operations Manager, if you would like a template of this Certificate that you can color print, enter individuals’ names, and hand out (with great fanfare) to your teachers. It is a special thank you to all the teachers and administrators that have made SSEP possible for the thousands of students—we as a team—are inspiring to reach for the stars.